Vallithai is a 76 year old widow, who lives with her physically challenged daughter, Bharti, who works as a domestic worker. They live in one of the poorest slum pockets in the city of Mumbai. Vallithai was finding it difficult to lead a life of dignity in a world where prices of basic commodities are skyrocketing. There have been times when Vallithai has gone without a proper meal to bed and has ended up spoiling her health as well. Bharti came to know about Dignity Foundation through one of the volunteers of the organisation in her area and approached us for help. Dignity sent a volunteer for a home visit to understand her situation. Their poverty level being so stark the social worker immediately recommended the case for ration support. India has very little social security for senior citizens. Pension coverage is as low as 11% of the workforce and 65% of the aged depend on others for their day-to-day maintenance. DIGNITY RATION SERVICE for poor senior citizens is a monthly basket of basic provisions for very poor senior citizens. 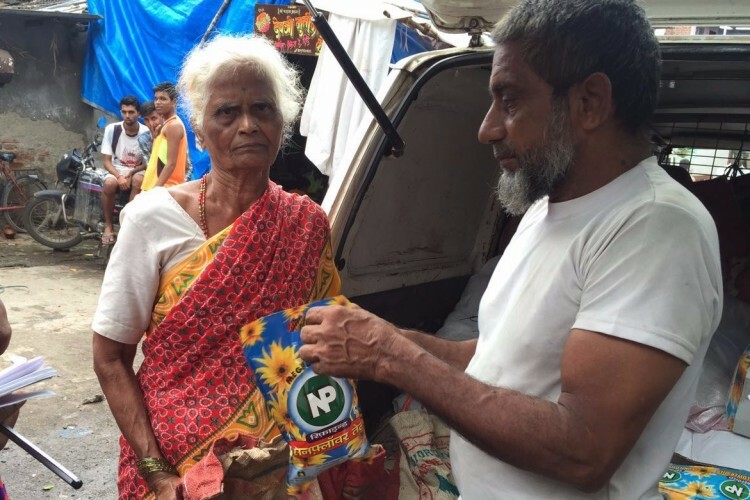 Dignity Foundation supports indigent senior citizens in Mumbai by mobilising philanthropists like you. Senior Citizens also call us on Dignity Helpline or come and meet us in person for ration support. The Ration supply process takes off after a physical verification by social worker or volunteer of the genuineness of the extent of poverty. Once a beneficiary is enrolled in the programme, they will receive ration month after month till the end of their lives, without fail. That is our commitment to the indigent senior citizens of our society. There are many more Vallithais out there whom we want to support and help them lead a life of dignity by providing them a basket of basic provisions. Do step forward and help people like Vallithai. Your contributions can make a huge difference in their lives. Just click the donate button and help people like Vallithai have a hearty meal! You could also help us by spreading this campaign amongst your friend circles via email or whatsapp, in social networking sites such as Facebook, Twitter, Instagram etc. Dignity Foundation is a not-for-profit organization that has been working for the cause of senior citizens for over 19 years. Dignity Foundation helps senior citizens deal with their insecurities (emotional, financial, health and safety) and loneliness and brings joy to their lives. Dignity offers senior citizens an enriching set of opportunities to lead a more dignified, secure, joyful and fulfilling life. Headquartered at Mumbai, Dignity has Chapters spread across six other cities - Kolkata, Chennai, Bengaluru, Pune, Ahmedabad and Delhi. Dignity Foundation is a long standing NGO dealing with the psycho-social challenges of senior citizens in India irrespective of their caste, creed and economic strata. The challenges of old age cuts across all strata of the society. Your share could be as good as a donation for DIGNITY FOUNDATION!